The Earthwave Beach Festival lived up to its billing as Cape Town’s most popular celebration of beach culture with spectators and participants leaving the beach smiling despite variable weather conditions ranging from sunny and mild to windy with rain squalls that ruined attempts to set new Guinness World Records for the ‘largest bikini parade’ and the ‘most surfers riding the same wave’ on Sunday. Successful beach touch rugby, tandem surfing, Dig for Gold and outreach surfing events along with an entertainment program that included exhibitors, vendors and live music acts kept everyone entertained throughout the day and into the evening. But weather forecasts in the media in the lead up to the weekend, predicting strong winds and rain on Sunday, prompted most of those who pre-registered for the record attempts to spend their day elsewhere and attendance for both the bikini and surfing record attempts fell far short of expectations. The third Earthwave Tandem Surfing Open, the country’s only surfing event for two people riding the same surfboard, was again the highlight of the day’s program in the pleasant morning conditions. Participants displayed technical lifts and amazingly innovative combinations with multiple wind and surfing champion Gary van Rooyen and partner Caitlin Brouckaert clinching the title and unique trophy. The Beach Touch Rugby Championships showcased the talents of some of Western Province’s top players while the inaugural Share the Stoke Outreach Surfing Games saw nearly 100 participants from the various outreach programs that use surfing as an incentive for enhancing the quality of life for youngsters from disadvantaged backgrounds competing in surf and beach events. Another highlight for youngsters was the Kingii Dig for Gold where dozens of pre-teens searched for valuable prizes in the beach sand to highlight the South African launch of the unique Kingii flotation safety device for all levels of water users. The entertainment program staged in the comfort of the Pavilion, on the water’s edge overlooking the action, featured top class music by the likes of The Rudimentals, 7th Son, Kings Down South and The Ryan Kidwell Band alongside a beach bar, food trucks, a range of vendors and environmental displays by SANNCOB and the SharkSafe Barrier. The seventh Earthwave Beach Festival was produced by Kahuna Promotions whose father and son duo of Paul and Dene Botha founded the event in 2006.The entertainment aspects were expertly produced by Regan and Monique Tacon from GoodTimes Events. The 2015 festival was supported by Kingii, Pole Yard, Rafikis, Happy Socks, Tuffy, SAPPI, NSRI, 7Stars Energy, UBER, Metrorail, Ola, Corner Surf Shop, Lifestyle Surf Shop, Hooley, Xpression on the Beach / Coreban, Signature Surf and Skate, Naish SUP, Surf Emporium, Reef Wetsuits, Surf Shack, Dept. of Sport & Recreation, Share the Stoke Foundation SA, In2Touch and many more businesses in Muizenberg and surrounds. The official digital media partner was www.Wavescape.co.za whose wave and weather guru Steve Pike was the official forecaster for the event. The Earthwave Beach Festival is sanctioned by Surfing South Africa (SSA), recognised by the Dept of Sport & Recreation as the governing body for wave-riding sports in South Africa. SSA is a member of the South African Sports Confederation and Olympic Committee (SASCOC) and the International Surfing Association (ISA). WHAT: The Earthwave Beach Festival is a multi-discipline sports and entertainment event. 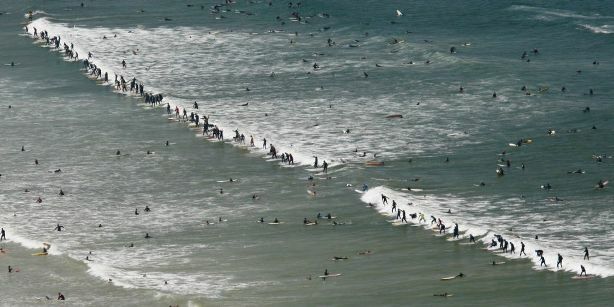 • The ‘most surfers riding the same wave’, where hundreds of surfers enter the ocean and try to all ride on one wave. Open to anyone who can catch and ride a wave straight towards the beach for 5 seconds. • The ‘largest bikini parade’, where women of all ages in two-piece swimsuits walk for a mile (1 610 metres) on the beach and are counted at the end of the course. WHERE: The sports activities are staged on the beach and in the ocean at Surfers Corner, Muizenberg. The entertainment and exhibition components are staged in the Muizenberg Civic Hall (Pavilion) located on the beachfront overlooking the action. Includes exhibitors, vendors, talks, live music, food trucks and a ‘beach bar’. Registration online – www.earthwave.info . Sign in from 10.30am on the day. Line up at 12h30 – enter the ocean at 13h00. One hour (approx. 6 or 7 waves ridden). Current record is 110 set at Earthwave in 2009.
WHO: The event is suitable for people of all ages and is FREE for spectators. 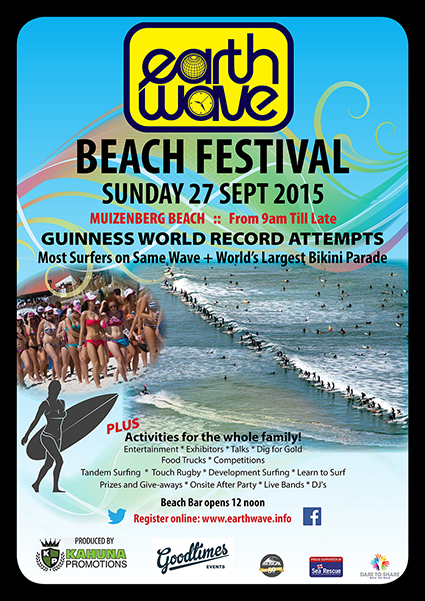 Sharing is Caring has become the theme for the 2015 Earthwave Beach Festival which showcases the beach lifestyle at Surfers’ Corner in Muizenberg on Sunday 27 September. Thousands of people have shared the event page on Facebook, which has now reached nearly 300 000 users, while beneficiaries of the world record events include the Dare to Share charity and the inaugural Share the Stoke Outreach Surfing Games will be launched at the festival. Highlight events at the one-day Earthwave extravaganza include an ambitious attempt to improve on the Guinness World Record for the ‘largest bikini parade’ set in China in 2012 when 1 085 women of all ages walked a mile (1 610 metres) in two-piece swimsuits, and an effort to increase the record of 110 surfers ‘riding the same wave’ set at Muizenberg during Earthwave 2009..
Online registrations for both events opened when the www.earthwave.info website went live this week and, with two weeks to go, hundreds of enthusiastic beach-lovers and surfers have already signed up for these spectacular mass participation gatherings. Participants in the record breaking attempts donate a minimum of R50 each and proceeds will be shared between the Dare to Share charity that does so much to assist those in need, and whose slogan is fittingly ‘Walk the Walk’; and the National Sea Rescue Institute (NSRI) whose admirable efforts keep ocean users safe. Companies, brands, NPO’s and charities are encouraged to leverage the immense popularity and media coverage for attempts to break world records by sponsoring groups of participants to raise awareness and funds for the worthy causes they support. The signing in procedure for the bikini record starts at 9am on the day at the Muizenberg Pavilion, with the parade along Muizenberg Beach between the Corner and the iconic bathing boxes starting at 11am. Surfers of all ages and abilities sign in at the same venue from 10.30am with approximately 400 participants expected to line up on the beach for final instructions at 12.30. The aspirant record-breakers enter the water at 1pm for an hour during which the organisers try to get as many as possible onto six or seven ‘party’ waves. The only criteria for surfers is that they can catch, stand up and ride waves straight towards the beach for the five seconds it takes to be counted in the record attempt. All those who complete either (or both) of the world record events will receive a certificate of participation via email. The Share the Stoke Outreach Surfing Games is an initiative developed by Rory Heard, head of the South African branch of the international Share the Stoke Foundation, and Surfing South Africa, the national controlling body for the sport. The event will include surfing and beach games for teams of youngsters from the various outreach programmes around the Peninsula that use surfing as an incentive to improve the quality of life of their members. Another first for 2015 is the live music acts, exhibitions, food sales and a beach bar in the Muizenberg Pavilion, right on the water’s edge overlooking the action. Doors open at 9am and the entertainment starts at 2pm, after which there will be a cover charge of R30. The second Earthwave Tandem Surfing Open will again feature clinics on 2-Up surfing, celebrity heats and a club contest. Perennial favourites like the high energy Beach Touch Rugby Tournament, organised by Sportsman Promotions, and the popular Dig for Gold where kids dig in the sand for valuable prizes will also be back. The official digital media partner is www.Wavescape.co.za whose wave and weather guru Steve Pike is the official forecaster for the event. Note: The Earthwave Beach Festival is sanctioned by Surfing South Africa (SSA), the governing body for the sport in South Africa and a member of the South African Sports Confederation and Olympic Committee (SASCOC) and the International Surfing Association (ISA). 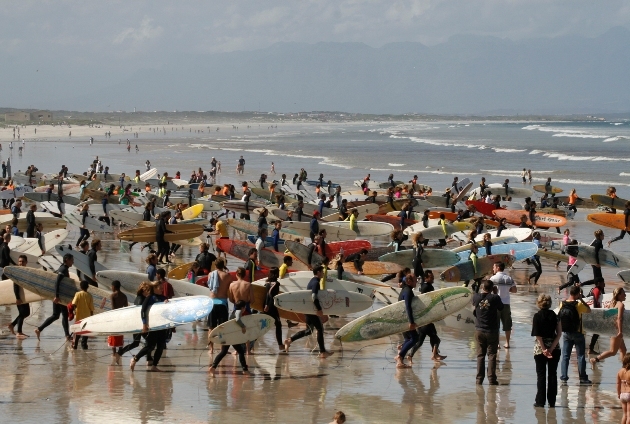 Anticipation for an action packed weekend of beach and surf events and allied activities at the BOS Earthwave Beach Festival has ramped up with the announcement that the two-day celebration of beach and sustainable lifestyles will include attempts to break two Guinness World Records at Muizenberg Beach on the weekend 19 and 20 October. The sixth edition of this popular gathering of Cape Town’s beach community will host another attempt to break the record of 110 surfers riding the same wave set at Muizenberg in 2009 alongside the WP Touch Rugby Challenge presented by the People’s Post where an attempt will be made to beat the current record of 27 hours for the ‘longest touch rugby game’. To break the touch rugby record, set in Australia in 2010, the WP Touch Association has selected two teams each comprising 16 players who will start playing at 8am on the Saturday and continue through the night on the beach until 12 noon on the Sunday, a total of 28 hours. The programme for the festival features a broad range of activities of interest to the whole family including surfing, skateboarding and paddling competitions, demonstrations of innovative surfing equipment and adaptive surfing as well as displays and talks on environmental topics, beach games for youngsters and ends with an awards function and after-party in the Pavilion. More than 400 local surfers from as young as seven to over 70, are expected to paddle into the gentle rollers at Surfer’s Corner at 1pm on the Sunday, many for the sixth time, to try and improve on the record they set at Earthwave four years back in what has become one of the surfing world’s biggest mass-participation events. Teams from schools on the Peninsula and the Boland will come together at the Western Cape Inter-schools Surfing Tournament presented by Billabong where they compete for valuable prizes. This event, along with a transformation initiative that sees teams from the four surfing outreach programs operating in the Muizenberg area competing against each other, is supported by Surfing South Africa and the Dept of Sport and Recreation. The top local stand up paddleboarders (SUP) and longboard surfers will also be in action with the Battle of Bay presented by Xpression the Beach seeing the SUP’ers holding short course races in the surf and a grueling long distance race to Kalk Bay and back before crowning the 2013 champions. Meanwhile the Xpression WP Longboard Classic includes members of the national team who did so well at the recent world championships in Peru and features divisions for juniors, women and men. 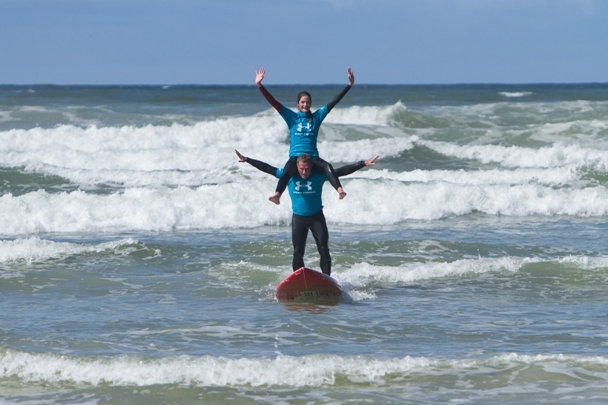 The interest in the second annual Similasan Tandem Surfing Champs, where a man and a woman surf together on the same board while completing acrobatic lifts and other skilful manoeuvres, has spawned the formation of the Earthwave Tandem Surfing Club which is holding its inaugural AGM in Muizenberg on Thursday evening. Skateboarding will be hosted at the festival for the first time when the Pipeline Skate Ramps Skateboard Comp sets up their eco-friendly range of ramps and half-pipes and runs demos and competitions for all-comers in street, mini and vertical half-pipe skating. Another innovation for the 2013 festival sees Wavejet Propulsion displaying and demonstrating their range of powered surfboards and SUP boards for the first time in South Africa, with members of the public invited to test these state of the art craft in the surf. There are valuable prizes on offer for youngsters in the BOS Dig for Gold treasure hunt and Tuffy beach cleanups while they have plenty of fun in the Similasan Beach Ball zone. The weekend reaches its crescendo with the awards function and after-party in the Muizenberg Pavilion on Sunday afternoon and evening when live bands and a DJ will provide the entertainment and food and beverages will be available. The BOS Earthwave Beach Festival is made possible by the support of BOS Ice Tea; Similasan; Dept. of Sport & Recreation SA; Xpression on the Beach; Wavejet Propulsion; Billabong; Rafikis; Diabecinn; In2Touch; Kahuna Creations; Natural Curve Surfboards; Zigzag Magazine; City of Cape Town; NSRI and more still coming on board! The People’s Post and Wavescape are the print and digital media partners respectively for the festival and Spike from Wavescape is the surf and weather prediction guru. All the ocean events at the 2013 BOS Earthwave Beach Festival are sanctioned by Surfing South Africa (SSA), recognised by the Dept. of Sport & Recreation as the national controlling body for the sport. Contact Kahuna Promotions on 021 783 4965 or kahunasurf@mweb.co.za for further information and see www.facebook.com/bos.earthwave for the latest details, including the full programme of events.